Largely what the article states is perfectly accurate, but there are caveats. First off, yes the F-35's EOTS hardware is now dated as it was based on emerging technology that would be included in the first generation SNIPER targeting pod, which is now more than 10 years old. Although some of the internal components of the systems can be upgraded, apparently it is not a plug-and-play affair. All the systems on the F-35 are 'fused' and many are related to one another. If something requires more processing power, cooling or power where will that processing power, cooling or power come from? There are also limitations as to just how much EOTS can be upgraded even if it were replaced in full by a totally new system. 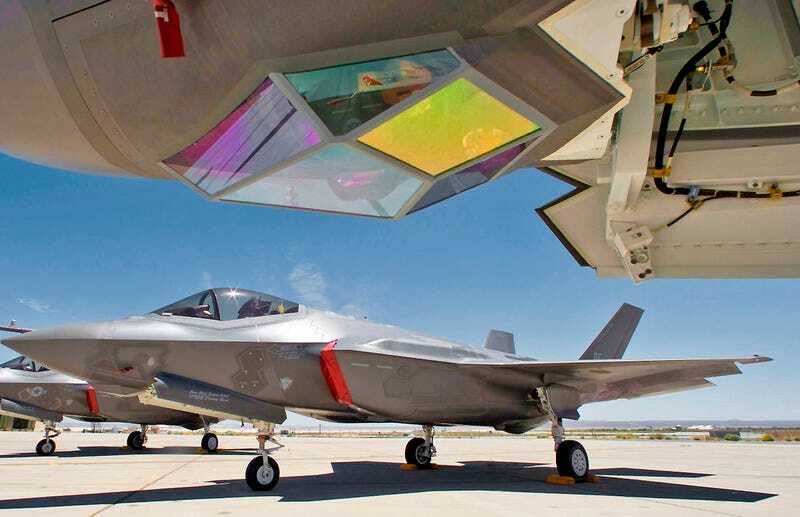 This is due to the tight internal dimensions that the systems is housed in within the F-35's nose, as well as the field-of-view of the faceted sapphire glass window that it looks out of. Bottom line, the system probably could could be upgraded for higher-resolution and magnification, but it would not be a cheap or easy affair when compared with strapping on a new targeting pod and integrating into an F-16's 'discreet' avionics suite. Now, what about the F-35's lack of a infrared pointer, which have become a common and highly praised tool for identifying and cross-checking targets with Joint Terminal Air Controllers (JTACS) on the ground and with other aircraft in the battle-space? There is no getting around it, this is a tool the F-35 lacks and will continue to lack without any foreseeable ability to retrofit one. What about the F-35 lacking the ability to downlink live video from its targeting system directly to controllers on the ground? Well, once again, this is a big void that will be left in the F-35's repertoire, and will increase its chances of fratricide or hitting the wrong target during close air support missions. The Remotely Operated Video Enhanced Receiver (ROVER) was developed urgently following the attacks of September 11th and the subsequent invasion of Afghanistan. By the mid 2000s, fighter aircraft equipped with ROVER were able to dowlink the exact images collected by their targeting pods to controllers in the fight below. Many have stated that this single technology has been the most revolutionary since precision guided munitions when it comes to providing fast and accurate air support for forces on the ground. Today, video downlinks have only improved and are a regular part of the CAS equation. Many targeting pods have this capability built directly into their housings so that the aircraft itself needs little modification to field it. The fact that the world's most advanced jet fighter does not have a simple video downlink capability along the same lines as ROVER is a testimant as to just how little the close air support mission has been factored into the F-35 design. This has not been only since its inception, but over the last decade and a half of close air support being the primary mission for US and NATO fighters. You would think that over the last decade retrofitting this somewhat simple capability into the F-35 would have been a top priority, but to this day there are no apparent plans to fit the F-35 with ROVER or anything else like it. So by and large The Daily Beast's report on the dismal state of the F-35's EOTS is accurate, and another reminder that we cannot believe the USAF brass when it comes to claims that the F-35 can replace existing fighters in the CAS role on an equal if not superior level. Additionally, this info makes the idea that the F-35 can take over the A-10's unique mission set even more laughable. Hang a modern targeting pod off one of the F-35's wing stations for close air support missions in non high-threat air combat environments. I know what you are thinking: "But won't that totally degrade the F-35's stealth edge?" The answer to your question is unequivocally yes, but the likelihood of providing widespread CAS in very non-permissible environment is doubtful, especially over a long periods of time. Also, the F-35 will most likely carry some ordinance externally anyway during missions in lower-threat environments. For missions where forces are inserted into highly contested territory or for battlefield interdiction missions, the F-35 will have to do without ROVER, an Infrared Pointer and a super-high definition infrared and optical targeting system. It is a reasonable trade-off with no other alternative available. Stealth always comes with a penalty, this is one of them and tactics can be worked up to lessen the impact of the F-35's CAS targeting capabilities. For instance, relying on the JTAC's use of their laser designator to paint, or 'sparkle' targets for identification more often, as the F-35 has a laser spot tracking capabilities. What is not acceptable is deploying the F-35 to provide precision close air support in a permissible air combat environment, as we have done for the last decade and a half, and have it rely on its clearly limited internal targeting systems. But seeing as the F-35 will replace so many other aircraft, such as the F-16, supposedly the A-10, not to mention the Hornet and the Harrier, it will have to be able to provide an equal or superior capability mix. Thus hanging a state-of-the-art targeting pod off the jet's wing, and integrating into the 'sensor fuzed' F-35 pilot interface, will be an absolute must if the EOTS system cannot be upgraded and a video downlink added. Still, just going with the pod would probably be a much cheaper and future-proof option. In all fairness, the F-35 may lack some key close air support capabilities found on other aircraft, but it also has some capabilities that no other fighter has that will aid in that mission. The biggest being, once again, a previously unrealized level of sensor fusion and intuitive man-machine interface. Whereas an F-16 pilot has to operate his or her systems and sensors largely as individual devices, the F-35's sensors and systems work as a team seamlessly. For instance, the F-35 pilot can simply look at a target and instantly cue every sensor to that point in space. Radar mapping, EOTS imagery, data-link contacts, ground moving target indications and everything else will instantly appear on the pilots Helmet Mounted Display and heads down 'glass' panel. There is no need to manually 'push' data around the jet's cockpit as the sensors and systems are all seeing the exact same thing. This capability can save time and enhance situational awareness. Additionally, the F-35's Distributed Aperture System (DAS) should be able to detect ground fire and vehicle movement, alerting the pilot as to where those actions are taking place. Finally, at night the F-35 pilot will have greater situational awareness than any fighter aircrew, once again leveraging DAS, their Helmet Mounted Display, and the jet's sensor fusion. Instead of peering through paper towel tube-like field of view night vision goggles, the F-35 pilot can look right through the floor of their jet at the target below in a panoramic nature. What I am getting at here is that although the F-35's EOTS system is dated and the jet clearly lacks other key close air support features, these deficiencies can be rectified at the cost of low observability. And although stating what the F-35 doesn't have raises eyebrows, it is a little less controversial and headline grabbing stating what it does have. In fact, with an advanced targeting pod added to all the F-35's other features, it would allow the EOTS to focus on tracking the next target to be engaged, locating friendly forces, or scanning the skies for enemy helicopters and fighter aircraft. Simply put, two EO targeting systems are better than one, especially when their data is fused seamlessly together. In the end, one would think that adding an advanced targeting pod to the F-35's external stores list would be a no-brainer and satisfy many of these concerns, but I have a feeling that doing so would put Lockheed and the JSF program into a place of trying to explain why a very unstealthy targeting pod is now an option on their stealthy and very expensive jet fighter that supposedly fields this capability internally. So far the program has a had real challenges being open and honest with the public about its trials and tribulations, with much of the media being blacked out on direct access to the program as a whole. So it is doubtful that admitting their own aircraft's limitations, along with coming up with novel solutions for those limitations, will happen anytime soon. In the world of F-35, no news is good news it seems these days. In the meantime, the years will drag on and by the time the F-35 is truly a combat ready aircraft as it was sold, its EOTS technology will most likely be close to 20 years old. Just for some perspective, twenty years ago the first generation LANTIRN targeting pods were finding their way onto F-14 Tomcats. Also The Sign by Ace of Base was the #1 song and Friends premiered. It was a long time ago.